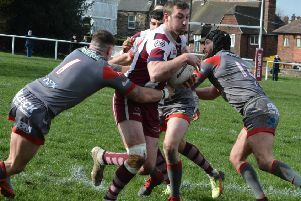 Thornhill Trojans were dealt a harsh lesson about what life in the National Conference Premier Division is going to be like as a disappointing showing against Rochdale Mayfield saw them crash out of the Challenge Cup after a 30-20 defeat. The Trojans were on a high after victory at Hunslet Parkside but they never really got going in this second round tie. Despite a rally in the second half Thornhill’s poor discipline cost them dearly as they ended with 11 men after two red cards. Both teams scored four tries each, the difference was that the visitors used the penalties which the Trojans gifted them to kick goals and pull clear. Trojans man-of-the-match was second row Jake Wilson, who ran tirelessly in what at times seemed a lost cause. There was also a good showing from George Stott as he registered a brace of tries. Zach Johnson also looked impressive until he was sent off late on. Thornhill made a terrible start as early Rochdale pressure resulted in prop Sean Hurley forcing his way over for a try. Zak Hartley converted and then added a penalty. A high tackle then caused tempers to boil over. Rochdale’s Mark Biggins was sin-binned for his part in the dispute but the referee then reached into his pocket and showed Thornhill’s Jack Gledhill a red card. Hartley kicked another penalty to stretch Rochdale’s lead to 10-0 before Thornhill finally showed some spirit with a try. Swift handling created an overlap and George Stott went over for an unconverted try near the corner. Rochdale took play blind from a scrum where space was created for winger Munya Samanyanga to score in the corner. Hartley converted and kicked another penalty as the visitors led 14-8 at half-time. Harsh words were exchanged by the Thornhill players during the interval and the Trojans seemed to have more direction as the second half resumed. The Trojans pressed for the Rochdale line and Matthew Tebb twisted his way over for a try from close range. George Woodcock converted. But two quick fire tries from the visitors left Thornhill with too much to do and victory was virtually secured. First Lewis Sheridan broke from inside his own half and showed superb speed as he raced away to score a long range try much to the delight of the travelling Rochdale supporters. A missed tackle left the Thornhill try line exposed and John Foy took advantage of the opening to cross for a try which Hartley converted. With Rochdale now leading by 20 points the Trojans produced a late flurry. A run around from close to the try line ended with Zach Johnson forcing his way over and Woodcock converted. Stott then burst through to reach out and plant the ball down for unconverted try. But this proved to be too late and Thornhill’s afternoon was summed up when tempers again boiled over after Zach Johnson was held up over the try line and the Thornhill man was shown a red card. The Trojans must now regroup and prepare to start their Premier Division campaign.